. 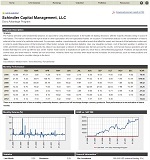 : What Are Managed Futures? 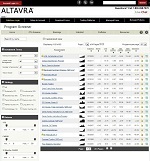 ALTAVRA DOES NOT CHARGE A LOAD, UPFRONT OR INITIAL FEE ON ANY ACCOUNT. THIS CONTENT AND ALL OF ITS LINKS ARE FOR INFORMATIONAL PURPOSES ONLY, AND IS CURRENT ONLY AS OF THE DATE(S) HEREOF. IT DOES NOT CONSTITUTE A SOLICITATION FOR ANY CTA OR TRADING PROGRAM, AND THE INFORMATION IS SUBJECT TO CHANGE WITHOUT NOTICE. THE FIGURES CONTAINED HEREIN WERE OBTAINED OR COMPILED FROM INFORMATION PROVIDED BY THE CTA, TRADER OR THEIR REPRESENTATIVES. NEITHER ALTAVRA NOR ANY OF ITS AFFILIATES OR EMPLOYEES MAKES ANY ENDORSEMENT OR REPRESENTATION AS TO ITS ACCURACY, VALIDITY OR COMPLETENESS. THE INFORMATION HAS NOT BEEN INDEPENDENTLY VERIFIED AND THEREFORE CANNOT BE GUARANTEED. 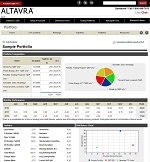 WHILE ALTAVRA MAY PROVIDE INVESTORS WITH CTA ANALYSIS, ALTAVRA DOES NOT PROVIDE “DUE DILIGENCE” ON AN INVESTOR’S BEHALF AND IS NOT RESPONSIBLE FOR A CUSTOMER’S INVESTMENT DECISIONS. NO OFFER OR SOLICITATION MAY BE MADE PRIOR TO REVIEW OF THE CTA’S CURRENT DISCLOSURE DOCUMENT (FORMS.ALTAVRA.COM), WHICH INVESTORS SHOULD READ CAREFULLY PRIOR TO INVESTING. INVESTORS MAY ALSO WISH TO CONSULT THEIR LEGAL, TAX AND INVESTMENT ADVISORS TO DETERMINE WHETHER AN INVESTMENT IS APPROPRIATE IN LIGHT OF THE INVESTOR’S RISK TOLERANCE, INVESTMENT OBJECTIVES AND FINANCIAL SITUATION. ALL FUTURES AND OPTIONS TRADING INCLUDING MANAGED FUTURES IS SPECULATIVE, INVOLVES A HIGH DEGREE OF RISK AND IS SUITABLE ONLY FOR PERSONS WHO CAN ASSUME THE RISK OF LOSS IN EXCESS OF THEIR MARGIN DEPOSIT. NO REPRESENTATION OR ASSURANCE IS MADE THAT ANY CTA OR TRADING PROGRAM WILL OR IS LIKELY TO ACHIEVE ITS OBJECTIVES, BENCHMARKS OR TARGETED RETURNS OR THAT ANY INVESTOR WILL OR IS LIKELY TO ACHIEVE A PROFIT OR WILL BE ABLE TO AVOID INCURRING SUBSTANTIAL LOSSES. 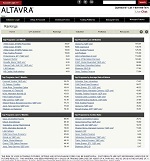 ALTAVRA Inc. is a Florida corporation, registered in the United States with the NFA and the CFTC. Copyright Â© 2017 ALTAVRA Inc. All rights reserved.